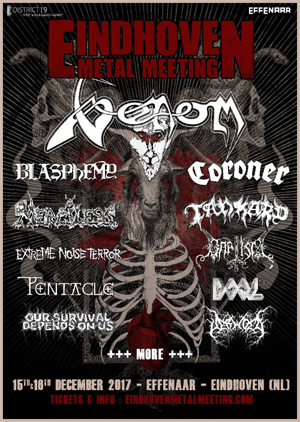 CORONER, BLASPHEMY, BAPTISM and EXTREME NOISE TERROR have been added to the line-up of Eindhoven Metal Meeting 2017. The ninth edition of Netherlands' loudest festival will take place on Friday 15 & Saturday 16th of December 2017, once again at the reputable Effenaar venue in Eindhoven. MERCILESS (SE) - Last show ever! The strictly limited Early Bird tickets flew out of the door! Regular combi-tickets (€85 + handling fee) are now available on the official festival website. Day-tickets and the schedule will be made available later on.